Mostly Monochrome investigates the possibilities that result when artists work in the seemingly reductive manner of limiting their palette to a single color or a tight tonal range. This reductivism focuses attention on formal aspects such as shape, edge, proportion, and a spectrum of surface textures. Several works in the exhibition blur the distinction between painting and sculpture, such as Peter Weber’s work in woven red felt, where the simplicity of the single color emphasizes the undulate folds of the structure and material texture, and in Bill Thompson's shadow-induced alternating tones on buoyant and playful zig-zaging dimensional forms. 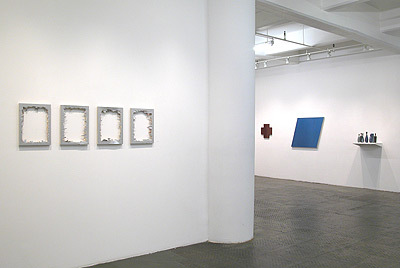 In Li Trincere's trapezoidal and cruciate paintings, the simple forms are enhanced by the rich and glossy surfaces achieved by the application of multiple coats of acrylic or sparkly enamel paint; meanwhile Matthew Deleget's humorously nihilistic single-color paintings are nearly destroyed by hammering out the centers, leaving an irregular maw of colored shards and the wall surface behind the remains. A grouping of unique mid-century Scandinavian ceramic vessels in tonal ranges of blue by Berndt Friberg for the Swedish company Gustavsberg and pieces from the Danish company Palshus draw attention to the elegant simplicity of their forms and the subtle variations in their glazes. Ursula Morley Price uses a monochromatic brown matte glaze on her roughly textured ceramic sculptures, enhancing the play of light and shadow on the paper-thin flanges enrobing her vessels. Daniel Levine's meditative works in white are perhaps the most reductive in the exhibition. Carefully, over several years, textured and precise fields of a single color are applied, yielding surfaces that change in response to varying lighting and movement of the viewer. David Mann creates a lava-like abstract landscape of deep red tones in his painting, with surfaces further modulated by layered dispersions and elliptical shapes. Karen Gunderson's intense black painting of ocean waves is built from directional brushstrokes of varying width, and uses the light passing across the surface to reveal her forms. Carrie Yamaoka's interest in material process is explored in sensuously glossy and reflective paintings made from resin embedded with Mylar and pigments which glimmer in changing light and at times feel weightless. James Lecce is similarly interested in sumptuous surface textures, but also the rhythmic play of tight tonalities in his layered, poured paintings of acrylic polymer emulsion enhanced with metallic swaths of color.